A quick Google search will tell you that Interior: Panic is the prequel to Tennessee William’s masterpiece, A Streetcar Named Desire. As a huge fan of that play, I was thrilled to see this production and revisit one of my favorite flawed females. This show adds a whole new dimension and understanding to the infamous Blanche Dubois (Blanche Shannon here). Happily, Interior: Panic also stands well on its own so it can be appreciated by theater patrons of all backgrounds. I adored this show. It shows us what it’s like for a young, pregnant Grace to live with her unstable sister, Blanche. Grace worries about her sibling and loves her deeply, despite also finding her to be scary and unpredictable. I felt there was an intensity missing in Caterina Fiorindi’s performance of Grace but Nick Wade was delightful as her husband Jack. Ultimately, Interior: Panic is less about this domestic conflict and more about Blanche as a character. Here we see her mental unravelling and hopelessness, complete with hallucinations, paranoia, and crazed anxiety. The dark show persists with layering on her psychological chaos until we feel trapped inside her head. Lydia Riding’s portrayal of Blanche absolutely stole my heart: she was pathetic but sympathetic, fierce but vulnerable, and always beautiful, despite barely grasping onto reality. It was a convincing, moving, and gorgeous performance. In particular, the heart-wrenching confession she shares with her sister was emotionally powerful. I’d be shocked if this woman doesn’t go on to win awards. My only complaint is that this show runs short at only 30 minutes. I was so profoundly hooked that I left the theater a little empty, wondering what happened next – and clamoring to re-read A Streetcar Named Desire. But that’s just my opinion and I’d love to know what you think. Do you love early-2oth century American dramas as much as I do? What’s your favorite Tennessee William’s play? Is he better than Eugene O’Neill or Arthur Miller? Join the discussion and tell me what you think in the comments below. 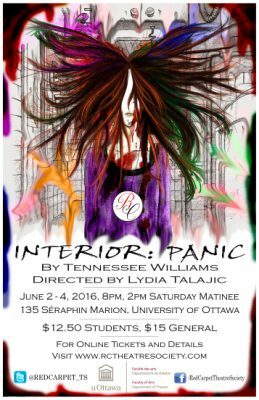 Interior:Panic is presented by The Red Carpet Theatre Society. It runs now through June 4th at Studio Leonard Beaulne on the University of Ottawa campus. Please note: To access the front door of the theater, you have to walk around the back of the building through the parking lot. Follow the construction signs. Visit their show page for performance times and to purchase tickets.